When actress Lupita Nyong’o was spotted mingling with Wintour — back in November — at the MoMa Film Benefit, many in the industry speculated that she would soon land in the magazine’s pages. The conjecturing proved to be legitimate, as Nyong’o was tabbed as the January It Girl. Nyong’o delivered a masterful performance in the 2013 film 12 Years a Slave; a role that has earned her a Golden Globe nomination for Best Supporting Actress in a Motion Picture. Although prior to her role in Blue Jasmine — which has also earned her a Golden Globe nomination (Best Actress) — it had been five years (The Curious Case of Benjamin Button) since Blanchett starred in a motion picture. But in addition to headlining Woody Allen’s comedy-drama, Blanchett co-stars in — George Clooney directed — The Monument’s Men, slated for February 2014 release. The lead editorial, Golden Hour, is authored by Jonathan Van Meter. 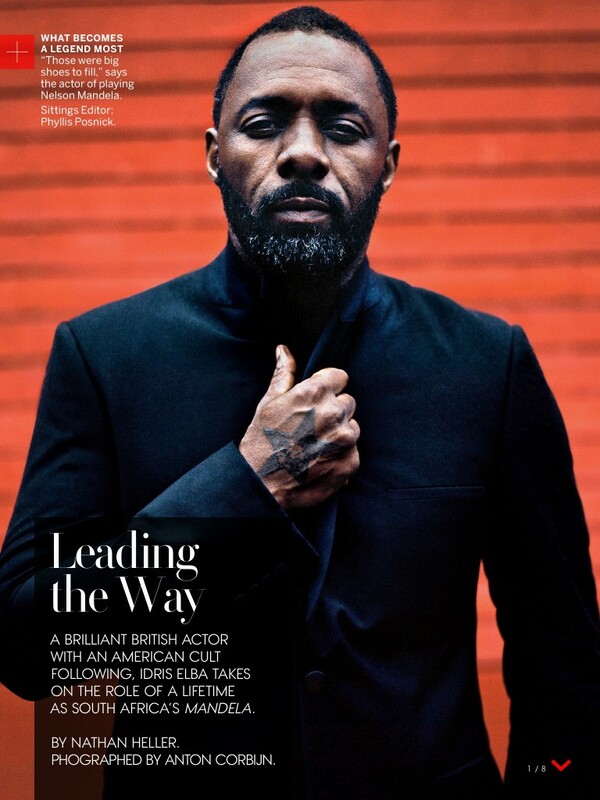 Another issue feature — also preparing for the upcoming award circuit — is British actor Idris Elba. Elba has had an American following for quite some time, with most recognizing him for his role as Stringer Bell on HBO’s The Wire. However, after a dominating portrayal of Nelson Mandela — in Mandela: Long Walk to Freedom — the London native has captured the attention of a much more global audience. Elba’s role of Mandela has earned him several nominations — including Golden Globe Best Actor — and though not yet announced, it is a given that that he will earn an Academy Award nomination, as well. Trends of the 2014 spring collections, from razzle dazzle to handkerchief hems, are featured in the More is More spread — styled by Grace Coddington. The issue is currently available on newsstands. This entry was posted in Entertainment, Fashion, Vogue and tagged 12 Years a Slave, Blue Jasmine, Cate Blanchett, handkerchief hems, Idris Elba, January 2014 US Vogue, Lupita Nyong'o Best Supporting Actress in a Motion Picture, Lupita Nyong'o It Girl, Mandela: Long Walk To Freedom, The Monument's Men, Woody Allen. Bookmark the permalink. 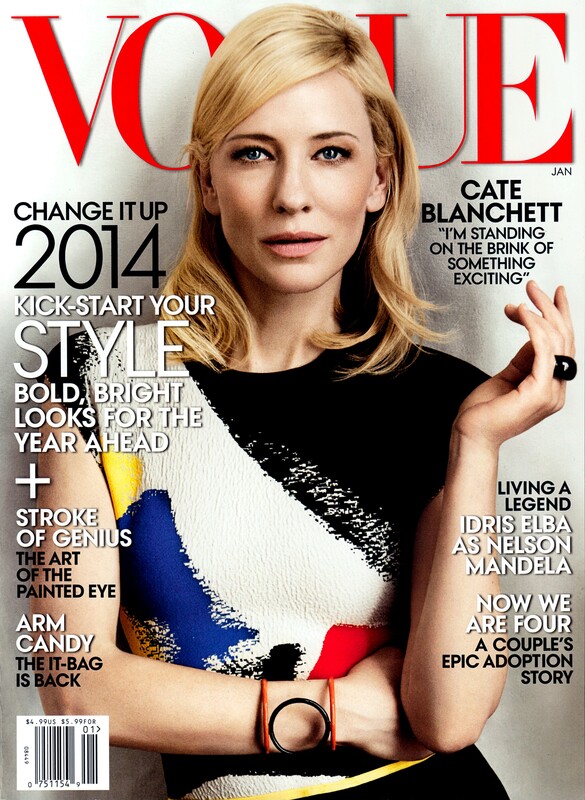 Nice punchy cover to start the new year… just what’s needed in January!